CHITTAGONG, Bangladesh — Mominul Haque hit 175 not out as Bangladesh took the upper hand Wednesday in the first test against Sri Lanka, ending the first day on 374-4. Mushfiqur Rahim missed a century by eight runs, out on 92 toward the end of the day, but he and Mominul combined in a partnership of 236, a third-wicket record. Opener Tamim Iqbal chipped in with 52. "We knew it was a nice wicket to bat on, on day one," said Tamim. "So it was most important for us not to throw our wickets away. It is normal for a batsman to get overexcited on such a wicket, and play a risky shot." Mominul's fifth century bolstered Bangladesh's position after Tamim gave the side a solid start on a placid wicket. Tamim launched Bangladesh's innings in aggressive style, hitting pace bowler Lahiru Kumara for three boundaries in succession in the second over of the day. Tamim and fellow opener Imrul Kayes shared 72 runs in only 16 overs. The opener reached his 25th 50 off only 46 balls and looked solid until off-spinner Dilruwan Perera bowled him. Tamim hit six fours and one straight six off Perera's bowling. Kayes made 40 before Sandakan had him leg-before on the stroke of the lunch. But the momentum that Tamim gave was maintained by Mominul. Together with Mushfiqur, he kept Sri Lanka frustrated throughout the second session. He took only 96 balls to reach his fifth century, the second fastest century for Bangladesh after Tamim Iqbal, who made a 94-ball hundred against England at Lords in 2010. Just when it looked like Bangladesh would end the day without losing a further wicket, Suranga Lakmal dealt a double blow in consecutive deliveries to remove Rahim and Liton Das. Rahim's 92 came off 192 balls, including 10 boundaries. Captain Mahmudullah and Mominul then saw out the day without any trouble, with the former ending the day on nine. "I think the last two wickets were big," Sri Lanka batting coach Thilan Samaweera said. "We have to put more pressure on Bangladesh in the first session tomorrow, and keep them under 500. I think that'll be a good effort." Mominul Haque hit 175 not out as Bangladesh took the upper-hand Wednesday in the first test against Sri Lanka, ending Day 1 on 374-4. Mushfiqur Rahim missed a century by eight runs, being out on 92 toward the end of the day's play, but he and Mominul combined for a national record of 236 runs for the third wicket. It was Bangladesh's highest score on Day 1 of any test, eclipsing 365-8 scored against the West Indies in Khulna in 2012. Opener Tamim Iqbal chipped in with 52. Mominul's fifth century bolstered Bangladesh's position after Tamim gave the side a solid start on a placid deck. The opener reached his 25th 50 off only 46 balls and looked solid until off-spinner Dilruwan Perera crashed his stump with a quicker one. Tamim hit six fours and one straight six off Perera's bowling. But the momentum that Tamim gave, Mominul didn't let it go. Together with Mushfiqur, he kept Sri Lanka frustrated throughout the second session. He was fluent and took only 96 balls to reach his fifth century, which was the second fastest ton for Bangladesh after Tamim Iqbal, who made a 94-ball century against England at Lords in 2010. In contrast, Rahim was slow in approach but gave Mominul strong support. 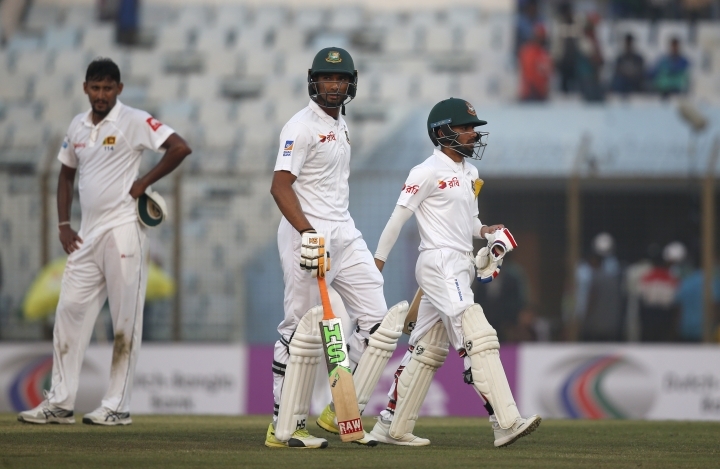 Captain Mahmudullah and Mominul then saw off the day without any trouble, with the former ending the day on nine. Lakmal claimed 2-43, while Perera and Sandakan picked up one wicket apiece.